Nearest: Tube Station: Marble Arch 299 yards (273 metres), Railway Station: London Marylebone 0.5 miles (0.8 km), DLR Station: Tower Gateway 3.8 miles (6.1 km), Motorway: M1 Junction 1 4.9 miles (7.9 km). Nicely located a very short walk from Marble Arch, Oxford Street and Hyde Park is the Marble Arch Inn London. Oxford Street is one of London's busiest and most popular shopping areas and leads to other busy areas such as Bond Street, Regent Street and Tottenham Court Road. Close by are two large and popular Parks, Regents Park (home to London Zoo) and Hyde Park. Nearest attractions include Speakers Corner (Sundays)(0.2 miles), Wallace Collection (0.4 miles), Alexandra Fleming Laboratory (0.5 miles), Madame Tussauds (0.6 miles) and Handel House (0.7 miles). This area is on the Northern border of central London. The Edgware Road A5 is just 80 yards from the hotel and gives links to north London and the North Circular A406. All bedrooms at the Marble Arch Inn enjoy traditional styling. They come with satellite TV, refrigerator, direct dial telephone, heating, radio, alarm, hairdryer, trouser press, tea and coffee making facilities. Also bedrooms are equipped with morning call system, shaving point and safefty deposit box. Cots avaiable. Most bedrooms have private en-suite facilities and all rooms have a wash basin. Triple and family rooms are available. Guests will find a breakfast basket in their room which has a Croissant, Fruit Yoghurt, Milk, Cereals and Orange/Apple Juice. Whatever the time you find the front desk remains manned round the clock. Hotel has a wireless internet service which is complimentary and provides luggage storage facilities. Compared to other London hotels: This hotel has been rated 70% by past guests. The London average is 80% and the average for 2 star hotels is 68%. Therefore while the hotel is below the overall London average you should note that this hotel is above average for its sector (star rating) . Milesfaster ranking: 739th from 866 London hotels, and 39th of 70 two star rated hotels. Another to Consider: Another hotel that is much like the Marble Arch Inn and not too far (2.3 miles, 3.7 km) would be the 2 star Wardonia Hotel, where prices begin from around £76 and which has a 74% guest satisfaction rating. Looking for lower base rates? Then another option might be the Travelodge Central Bank. 0.5 miles from here (0.8 km), has scored 80% from former guests and whose lowest rates start at about £49. Something close by with a great client rating? We suggest the 3 Star Motel One Tower Hill may well be of interest to you. The Motel One Tower Hill is only 0.2 miles (0.3 km) away. A highly rated hotel with a guest score of 90%. 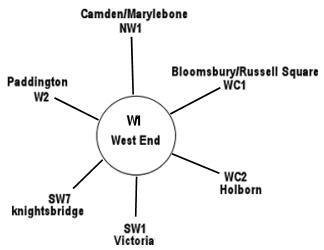 The 50 hotels nearest to this location (49-50 Upper Berkeley Street, W1 postcode) that we list cover a 0.6 miles (0.9 km) radius. They breakdown as follows: 12 five star hotels (average rating 88%), 22 four star hotels (average rating 81%), 11 three star hotels (average rating 74%), 4 two star hotels (average rating 68%) and 1 one star hotel (rated 62%). Top 2 star hotels are Marble Arch Inn (this hotel) and the Linden House Hotel (both 70%). Overall the best rated hotels is The Beaumont London (5 star) at 99%. For the nearest 50 hotels in the area we have base rate data on 49 of them. The average starting rate looking at all the nearest hotels to this location is £177 per night. The cheapest standard rates begin at £35 at Linden House Hotel (2 Star, 70%) while the highest base rates are £739 at Marriott Grand Residences Mayfair (5 Star, 90%). Averages listed for each individual star sector: Five Star average: £354, Four Star average: £155, Three Star average: £72, Two Star average: £35 and One Star average: £49. Our in-house ranking based on guest ratings but adjusted for influencing factors ranks Marble Arch Inn 41st (joint) of the 50 local hotels and 1st (joint) for the 4 two star hotels in the area. 11th of 49 (4th of 4 two star hotels.) for base rates ranking. Scoring the hotels rates and review score together we rank the hotel 40th of 47 when judging value for money (The Arch Hotel was top).